I am taking some time to give my sister-in-law’s SN some love for her birthday. It has seen many years of abuse and my brother is too busy (lazy) to give it the maintenance it deserves. It’s a 92 650, has aluminum pole, footholds, prop and other basic bolt ons. Turf is completely shot. The previous guy did a bit of a hack job with it, and I’m hoping his poor attention to detail isn’t present in the glasswork as well. 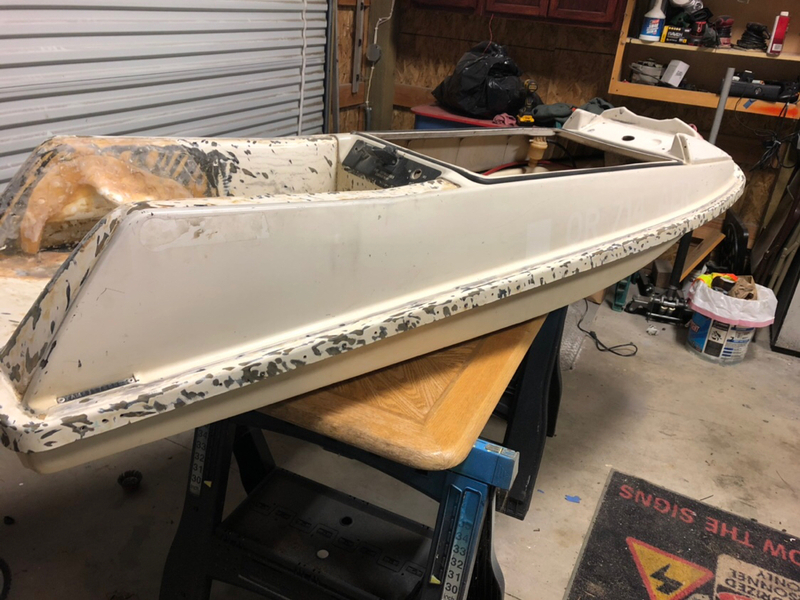 The plan is to returf tray and side rails, spot repair glasswork on footholds if needed, clean/paint the engine compartment, inspect/repair drivetrain and buff the ski to bring some shine back. Also fix some damage on the nose where it looks like someone found the bottom of the lake. This will be my first go turfing a ski with footholds. Any advice is welcomed. I know that a heat gun will be my friend on this project, especially with winter temperatures. I am going to attempt buffing but if it doesn’t work out I will probably end up painting the ski. We will see how she goes. Made some progress removing turf tonight. It’s slow going though with a putty knife lol. The underpad came up easy but the turf in the foot wells is a pain. Any tips for removing turf efficiently? This is awesome, glad to see you paying it forward. Building a SN for my second cousin that will be 16 in August. The easiest way to get the turf off is with a oscillating tool. Harbor freight and Walmart has them for under 30 bucks. Other than that, a sharp chisel and a mallet works well. 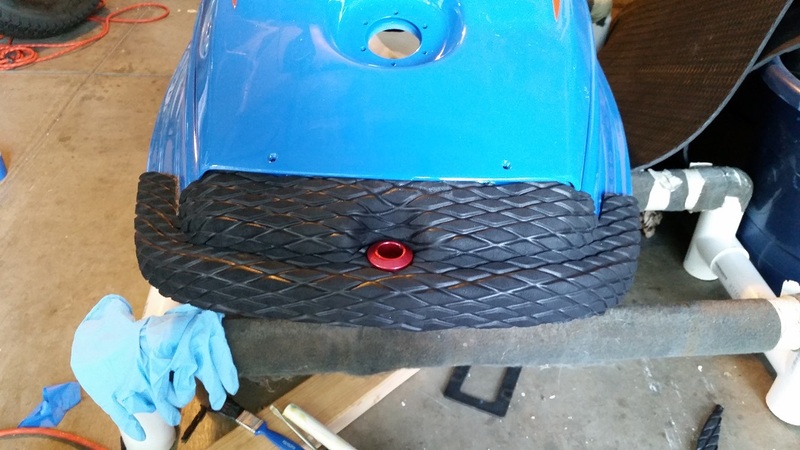 For the front of the ski cut the nose bumper to match the side rails and turf over it. When you lay the new turf make sure you acetone everything first. And use the RED contact cement. And NOT the water soluble stuff. Do not use the heat gun too much as the turf with shrink back down. I found it helps to pattern everything with alunminum foil. And throw the whole piece of hydroturf in the dryer for a minute to warm it up. link to my full build. Thanks guys for the tips, that advice will come in handy for sure. After wiping the ski down today, I realize that the paint probably isn’t worth saving. 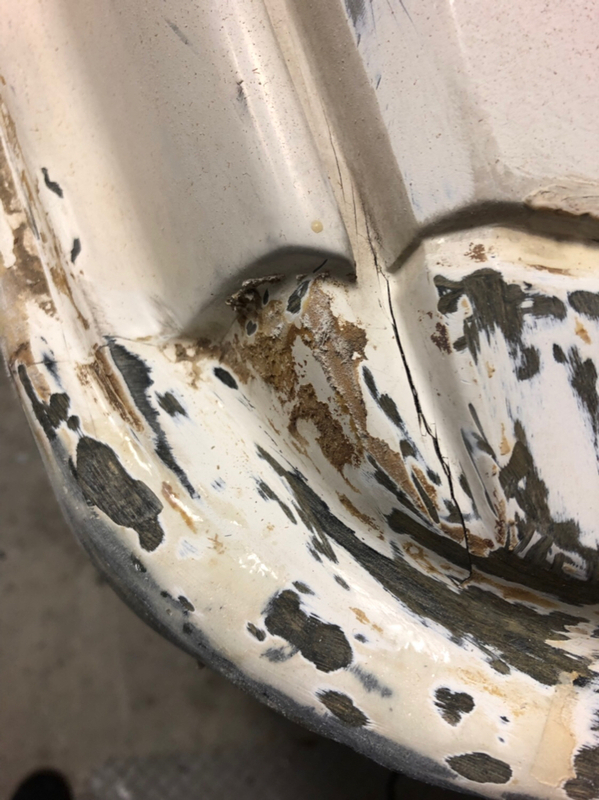 It’s likely the original paint and it is chipped and scratched to poop. It also doesn’t match the white handle pole which looks to be rattle canned. So now I am considering options for painting. I don’t have much painting equipment. I have a buddy who knows how to do gel coat so might consult him. Might be able to set up a paint booth in another friends shop. Or...rattle can? Never painted a ski before so if anyone wants to chime in with advice please do. 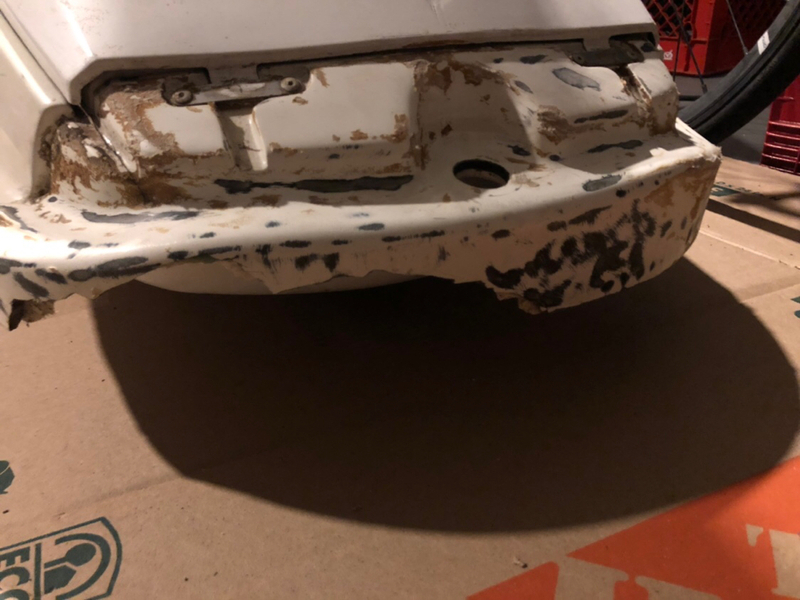 Also what steps should I take to prep it for paint? Be glad to answer any questions on the turfing for you.But looks like you have a number of things to address beforehand. Hell ya let’s get a paint booth set up this Thursday! Had to put this project on the back burner for the past couple weeks. But finally got it all torn down tonight. The hull is in mostly good shape, just have to fix the nose and get it ready for paint. Going to have a buddy gel coat it white (yes, another white sn). The tray is a bit dinked. Whoever installed the footholds didn’t do a very good job. It appears they did not know how to use sandpaper. Some the seams of the glass mat are peeling up and none of them are smoothed out. So I will likely sand them down with a sanding disc and bush on a layer of epoxy to get rid of the imperfections before I do turf. 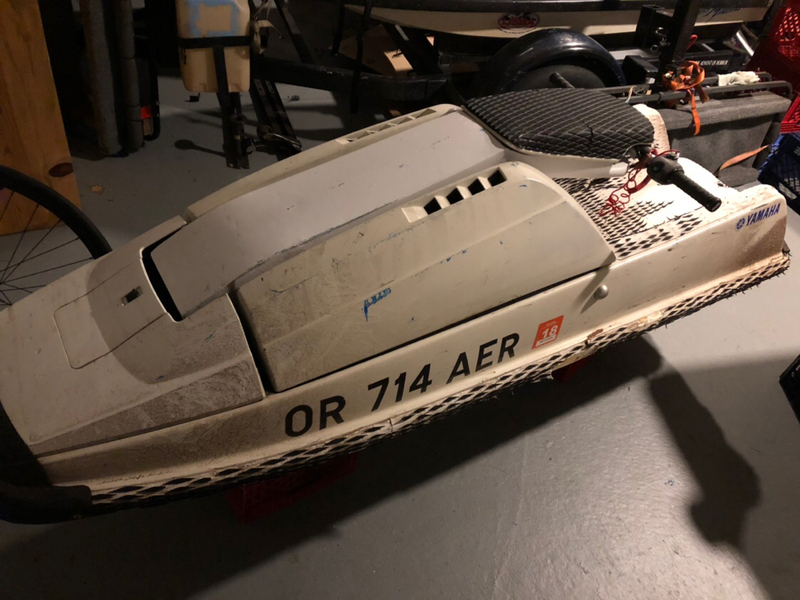 If I had more time and resources I would probably cut them out, but this ski needs to get finished so I have my garage back. Spend the little extra time now on it while it's torn apart! If you don't want to cut the holds out,then at least put a layer of 12 oz glass strips all the way around the holds.That should hold them in better and not cause it to leak. Been chipping away at this thing. My brother put the pressure on and wants it done by mid April. So time to get things moving! I glassed up the nose this week where someone found bottom. Laid it up against a piece of cardboard to hold the shape. Once it started to set up I removed the carboard so it didn’t stick. Made that mistake on my sn doing this same repair and now there is PBR box fused to the ski lol. Worked on getting all the turf remnants off with a wire wheel. Went well, but some of the contact cement just smeared around and didn’t really come off. So will have to hit it with some solvent. I also cannot get the remaining turf and underpad out from inside the footwells. Any tips? I might just say forget it and turf over it. Finished cleaning up the rails and peeling stickers. Ready to sand. Probably just going to use an orbital with 80grit to rough it up before hitting it with appliance epoxy. Also have to hit the nose with another layer of glass to even it out a bit better. I discovered another crack on the nose, but it’s not very deep so will just grind it out with a dremel and fill with thickened epoxy. Started chipping away at the glass on the footholds tonight. Verdict = garbage. Whoever installed them didn’t even prep the surface and didn’t bother to wet out the mat. It peeled up super easily with a putty knife. Forgot to take a pic but it will all have to be removed and redone. Hopefully going to get it finished up this weekend. 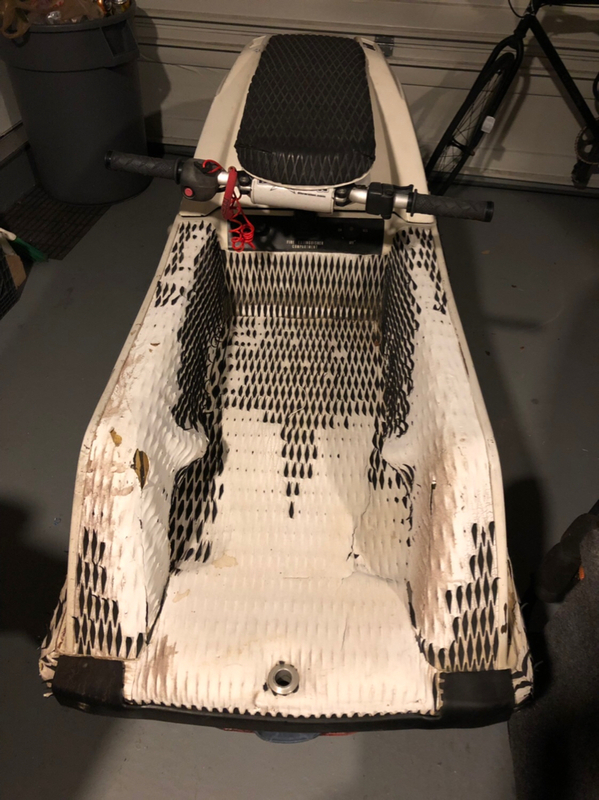 Doesn't surprise me.I've returfed a couple skis and found the same problem.Probably went down to the local Walmart to buy a glass and vinyl ester kit thinking that's all they needed to do.